Well, I’ve been home from Walt Disney World for two weeks now, and I’m already craving some dishes and snacks I know I’m going to have on my next trip (um…Karamell Kuche, anyone?). 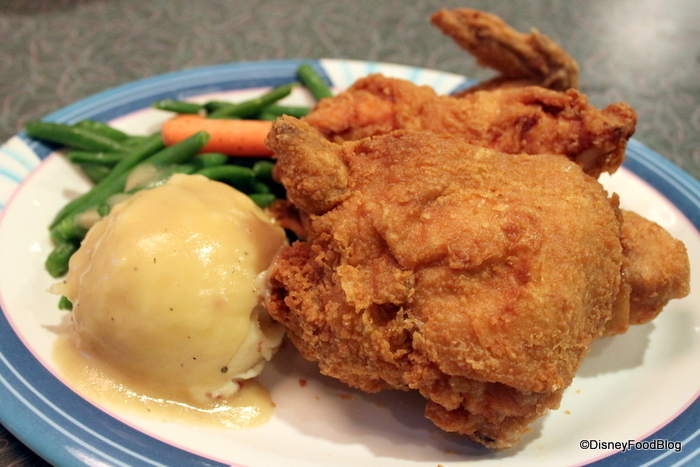 This classic, simple dish has been on the menu at 50’s Prime Time Cafe in Disney’s Hollywood Studios for ages, and we’re glad it’s not going away! 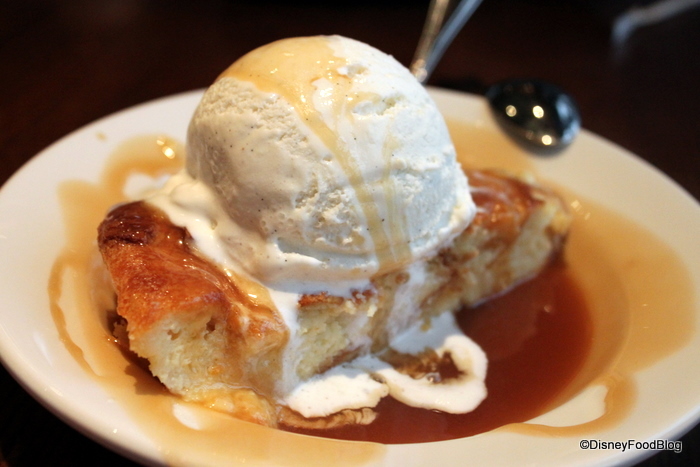 Folks wrote about loving the wings appetizer and the dessert — that fabulous Bananas Foster Bread Pudding — at ‘Ohana in Disney’s Polynesian Resort! 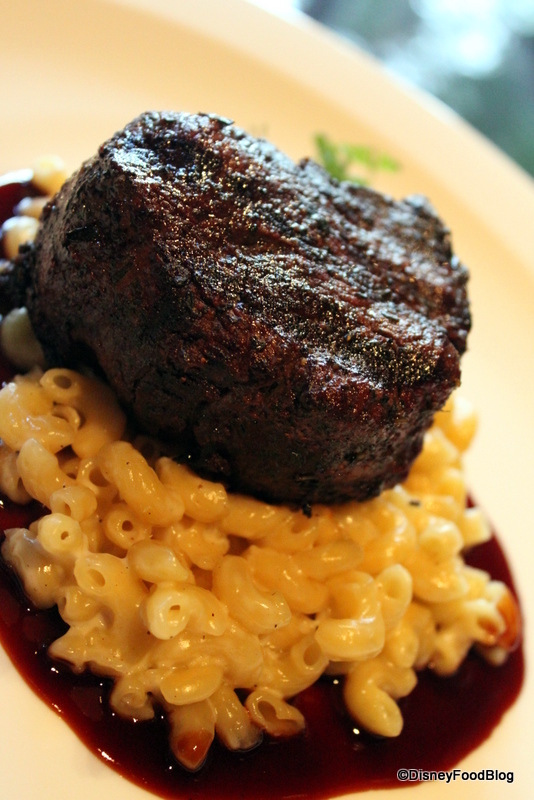 A clear favorite with Jiko-devotees, the robust filet and rich mac and cheese accompaniment are a perfect pairing of flavors. Add that red wine sauce and we’re in heaven. You USED to be able to find it at Jiko at Disney’s Animal Kingdom Lodge Resort, but according to a few informants on our Facebook page, the menu item has been replaced. Now you can get the filet with an au gratin potato side dish. Sigh. 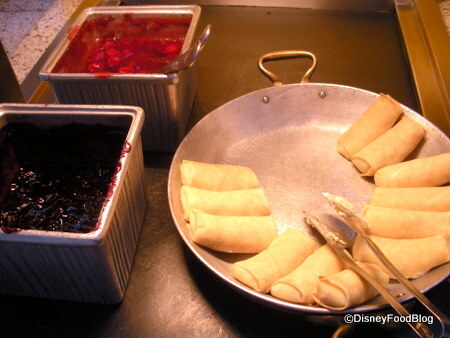 Pluto’s Cheese Blintzes on the breakfast buffet at Chef Mickey’s restaurant in Disney’s Contemporary Resort are the highlight of the morning for many diners! A quietly addicting dish, this rich soup at Artist Point in Disney’s Wilderness Lodge has turned many mushroom-haters into fungi fans. 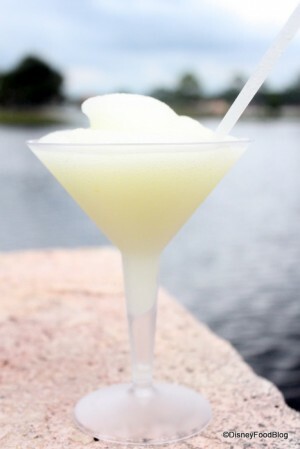 One of the best-loved alcoholic drinks in all of Disney World! Sweet, tart, frozen — doesn’t get any better than that. 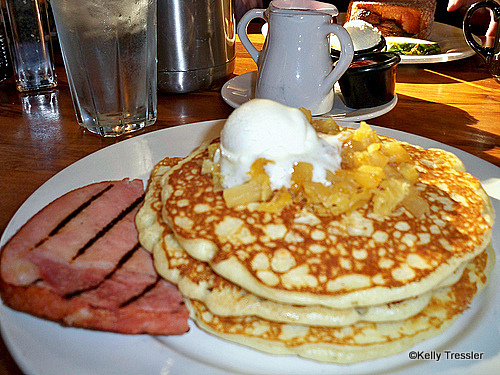 Two of the World’s best breakfasts can be found at Kona Cafe in Disney’s Polynesian Resort! A favorite from way back, this snack eats like a meal! 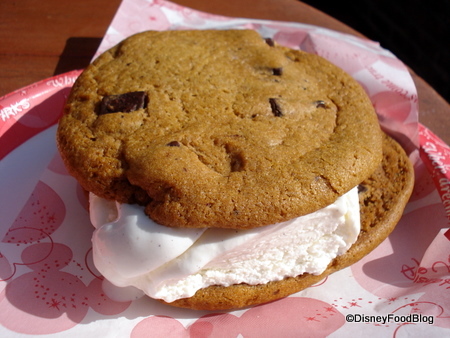 The Homemade Chocolate Chip Cookie Ice Cream Sandwich can be found in at least one location in each Disney World theme park. You don’t have to tell us twice! If there’s chocolate and peanut butter in the name, we’re there. This giant confection from Starring Rolls Cafe could easily feed two! 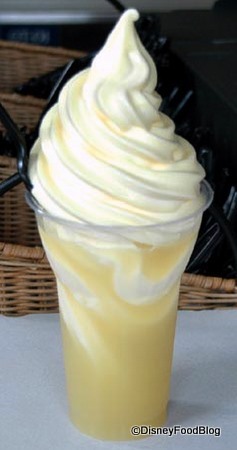 The Dole Whip is a classic snack that’s been delighting Disney fans on both coasts for decades. While possible to get it in several flavors, our favorite is the original pineapple! Aloha Isle in the Magic Kingdom is one of the most popular places to get them. While they have this yummy carrot cake cookie at the Scary Apothecary now, too, we agree that the Writer’s Stop is the best place to get one! This incredible collision of salty, sweet, tart, warm, cold, and fried makes an ideal lunch or dinner! Quite possibly the world’s perfect food. Find it in the den of wonderfulness we like to call Cafe Orleans. You can find ’em all over Disneyland resort — lucky for those who are craving them! What are YOUR biggest Disney food cravings? Share them with us in the comments section below! Thanks to JLovely and Kelly Tressler for the use of photos submitted to the Disney Food Blog Photo Extravaganza on flickr; and thanks to Betsy Bates for sending along her Artist Point photos! Oh I just got back, and I’m already craving the crab cake at Flying Fish and arancini from Citricos! Ooooh! My fiance and I are going to Orlando (and thus WDW!) for our honeymoon in May next year – it’s his first time, and my first time for about ten years. So, my question is, do they still do the chili cheese dogs at EPCOT? I am fairly sure it was there, anyway. They have haunted me for the last decade, ha ha! We’re so excited. I love how food makes for such powerful memories of a place. Great photos too – thanks! Definitely the napoleons from France. I don’t like regular napoleons, but these are amazing. The macadamia nut pancakes look fabulous too. Do they have macadamia nuts inside of them? I can never tell from the pictures. Tonga Toast, definitely. And I will be there in TWO DAYS! Tonga Toast is good, but I think the star of the Kona breakfast is the Samoan. 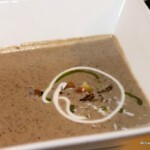 I tried it last week when I was there for breakfast, and the textures and flavors of the ingredients meld together in quite a unique and enjoyable fashion. 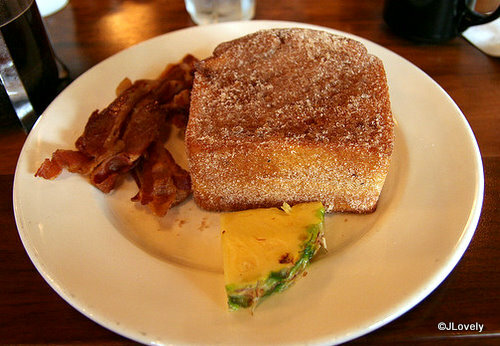 I much prefer the savory and mixed tastes of the Samoan to the sometimes overpowering sweetness of the Tonga Toast. No more steak ‘n mac at Jiko??!! Say it ain’t so. We have ressies in December and that was going to be my order. Fingers crossed that they come to their senses by then. It definitely has to be the Nescafe Coffee in the resort food courts! BLECH! 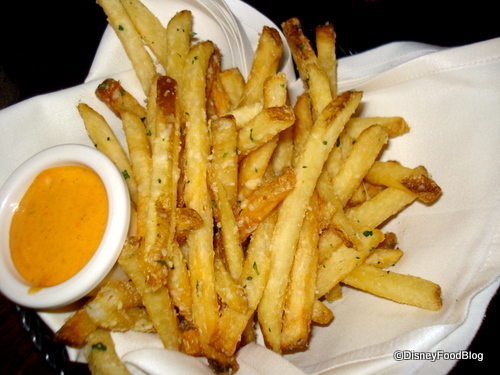 Can we have a post devoted to the worst food on Disney property? That would win hands down. Cinnamon Roll from Main Street Bakery and Ice Cream Sandwich from Main Street Ice Cream Parlor. Impossible to say, there are just too many things I would love to be digging into right now. Beignets from PO, Tonga Toast, Spaghetti Fra Diavolo from Mama Melrose, Lobster at Narcoossees, the sandwiches at Earl of Sandwich and on an on. But most of all, very simply for me, would be sitting in the Hole in the Wall outdoor bar at Raglan Road with a pint of Smithwick’s Ale and a plate of fried scallops from Cookes of Dublin. That would be heaven on earth or at least heaven at Walt Disney World. The thing I craved most in the months following my last vacation was the pastitsio at Kouzzina. What a wonderful comfort food! Earl of Sandwich the All American with the cranberry sauce – it rocks my world. Hard to go wrong with the pot roast at 50’s Prime Time! We ALWAYS at least share a Chicken Shawrama Platter at the Tangerine Cafe! What a terrific meal. Gotta also add a vote for the Carrotcake Cookie. Such an amazing snack! Another item on our “always” list is the chili-cheese fries at Pecos Bills. Another fun snack that takes the edge off without having a full meal. For Disneyland, I was a slave to the Corn Dog from the Corn Dog Castle. 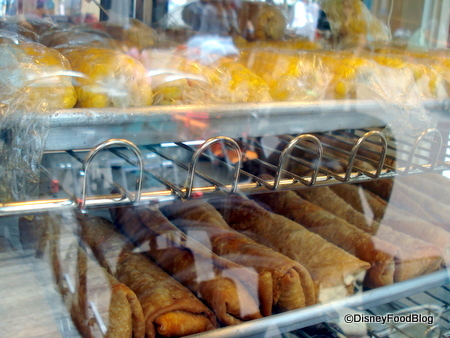 The stand is no longer there, but there is another spot in CA for a hand dipped corn dog. Ahhh, everytime I think I’ve got my final list of restaurants to visit on our next trip, AJ’s posts have me realising what I’m missing in other places! Ohana might have to make it back onto the short list. I love the Writer’s Stop but never had the Carot Cake Cookie – that’s definitely one not to miss next time. 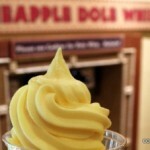 Plus I only discovered Dole Whips last year so that too. Have a feeling I’m going to spend my whole trip eating. Kim — Hee hee! Me, too, after writing this! 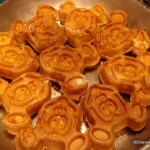 Carolyn — You’re in my boat: craving lots of foods from a LOT of different Disney parks. 🙂 When’s your vacation? Angeline — Sounds good to me! Sara — Yep; macadamia nuts in the ‘cakes. 🙂 And I’m with you on just about any pastry from the France pavilion! Sharon — Tonga Toast = yay! RichT — Thanks for the suggestion. If you’re craving sweet for breakfast, go with the Tonga Toast; but if what you want is a medley of flavors, the Samoan is a good choice. Might try it next time if it’s still on the menu! Erin — Agreed. We got lucky in September, as it was still on the menu. I’m hoping the au gratin potatoes are just a fill-in until the new bulk order of noodles comes in. Dana — Ha! 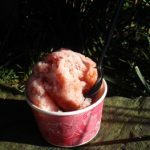 I might have to do that “worst foods in WDW” post! Tiffany — Isn’t that a wonderful cinnamon roll? Also love the one from Disneyland! Alan — What a wonder picture painted! I want to be right there with you, except I think I’d have a burger…and a Doh Bar! Melissa — Comfort food is what WDW does best! Did you grow up with greek-inspired food? Amanda — Just in time for Thanksgiving! John — I am a new slave to the Disneyland corn dog. So glad you can still get them at DL and DCA! Cheddar Cheese Soup from Le Cellier, Fish & Chips from the little stand outside the Rose & Crown, a Cookies & Creme Shake from Sci-Fi Dine-In Theater, and a Strawberry Tart from Boulangerie Patisserie. I just ate lunch and now I’m hungry again! 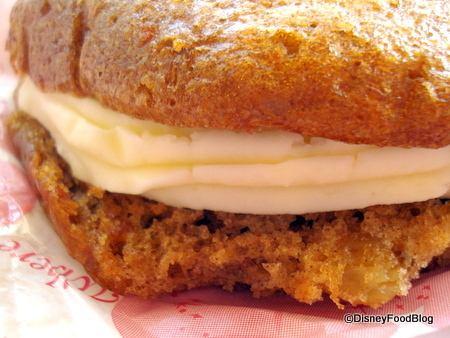 I just had the Carrot Cake Cookie sandwich 2 days ago, for breakfast, and am now addicted!! Brenda — We expect more later! Diane — Two votes for the Pot Roast! Ivis — Me, too! Thanks for the comment! I love these pictures. I am so craving everything! Grey Goose slushy and Dole Whip being the top runners. I haven’t been lucky to eat around the world yet, but it is something that I am looking forward to doing more when I can get down to the world again. So hungry now! 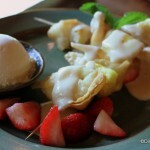 I am going to have to say pretty much the entire meal at O’hana- I love it so much we went twice on our trip last week. Also the fillet and mushroom risotto at Le Cellier is delicious sad that they are going to be a signature dining soon and hoping they do not change the menu too much when that happens. Gotta go with the Jalapeno Cheese Filled Pretzels! While it’s easy to find nacho cheese dipping sauce, the filled pretzels are becoming harder and harder to find. There is a stand at Animal Kingdom before you cross the bridge into Asia and a cart as you pass into Disneyland’s Frontierland. Other places, like the Magic Kingdom’s Lunching Pad have discontinued them recently. The cream cheese filled pretzels used to be at Scuttles and I can’t remember the last time I saw the apple filled pretzels. Hmm, the quest continues! 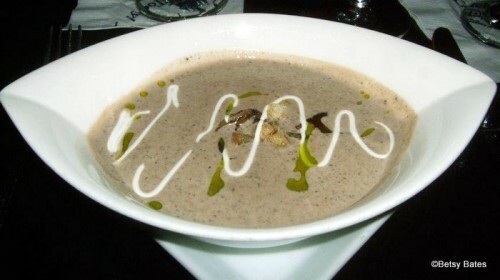 I was at Jiko last week, and the new potato is actually quite good, refines the dish a bit. However, the mac and cheese is still available on the kids menu, and our server mentioned that it could still be prepared as the original dish…. Steve — Now THAT’S some great news!! Thanks for the info! Although I may never get to fully enjoy one, what is the Pluto’s Cheese Blintzes? They did not have the mac and cheese with the filet last June. I asked if I could substitute the mac and cheese for the current side. They let me with no hesitation. I love Jiko! 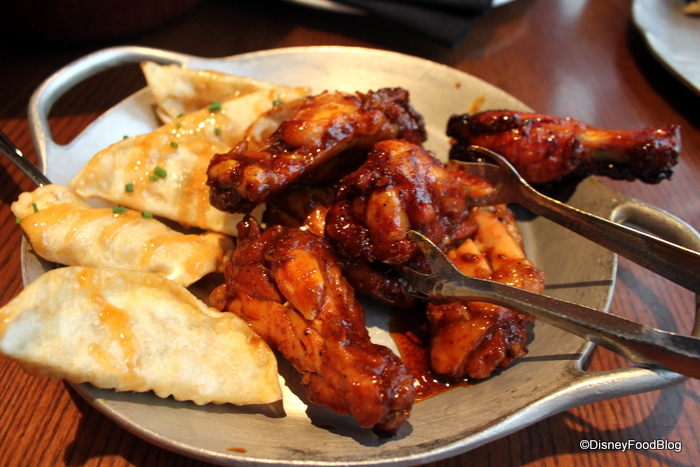 I’m craving Kaki Gori, jalapeno cheese pretzels, and sweet and sour chicken from yak and yeti QS. Brandi — Yep!! They’ll let you substitute (or just get it as an extra side, which is what I do!) Great tip!! Also, jalapeno cheese pretzels — LOVE! Sushi at California Grill and the lapu laupu at the Polynesian! Mickey waffles, ice cream cookie sandwiches, funnel cake..
Barbecue chicken on cheese bread Handwich. 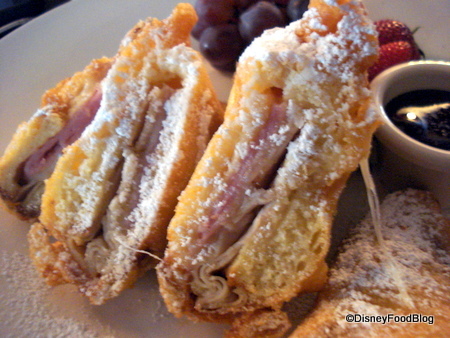 My husband asked me last night what my favorite food was from all the places we’ve been and “Monte Cristo” sandwich during our honeymoon at DisneyWorld popped into my head. I’ll never forget the “to die for” taste, and that’s been 38 years ago! So I’m up at 4a.m. looking online for the sandwich. What an absolute treat to read about others who feel the same way, as well as see the other yummy foods on this website. Thanks!! Oh my, I’m SO hungry now!! Dole Whip I get. Also I crave the Liberty Slush and the Jungle Juice slush from AK. Tonga Toast I just had for the first time this weekend. Am I the only one who thinks it’s gross? Without a doubt, when I’m at Animal Kingdom, I have to go to FlameTree Barbecue and get my usual: Half a chicken with the sweet barbecue sause from the condiment table, along with the baked beans (what flavor! ), cole slaw and an order of onion rings! NEVER have been disappointed when I get this! Yes the pommes frites at cafe Orleans along with the monte cristo is the best meal I ever had in all of my Disney travels. We go to disneyworld every year but went to Disneyland last year too and can’t wait to go back for our cafe Orleans meal!!! It is amazingly good! We crave the tempura udon at Katsura Grill in the Epcot Japan pavilion. We’ve been going there for it (even before the restaurant changed to Katsura Grill a few years ago) as our go-to lunch spot since our girls were little (about 20 years!) It’s especially good when the weather is cool, but we’ll eat it anytime!